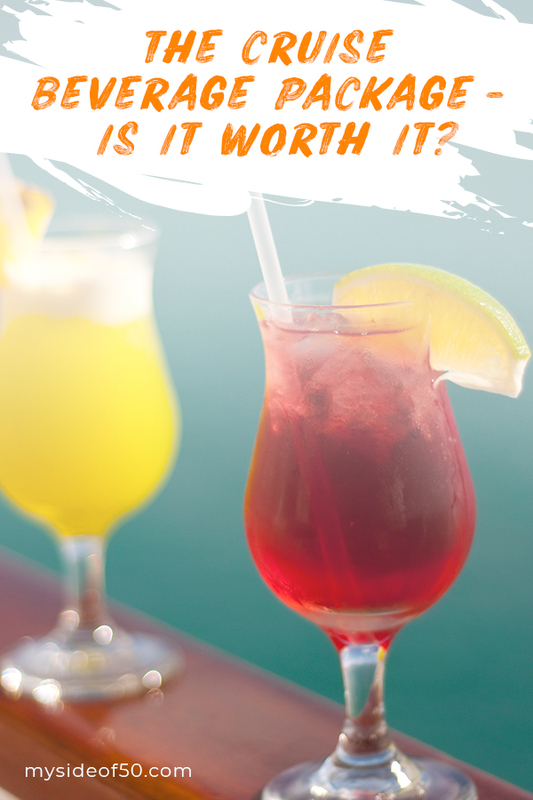 The Cruise Beverage Package | Is It Worth It? When you put down a substantial chunk of change for a cruise, you may be surprised to find out that although it’s all-inclusive, the one thing it doesn’t include is beverages – other than your basic tap water, coffee and tea. You incur additional charges for any alcohol, bottled water, soft drinks, fruity frozen mocktails or specialty coffees you consume. 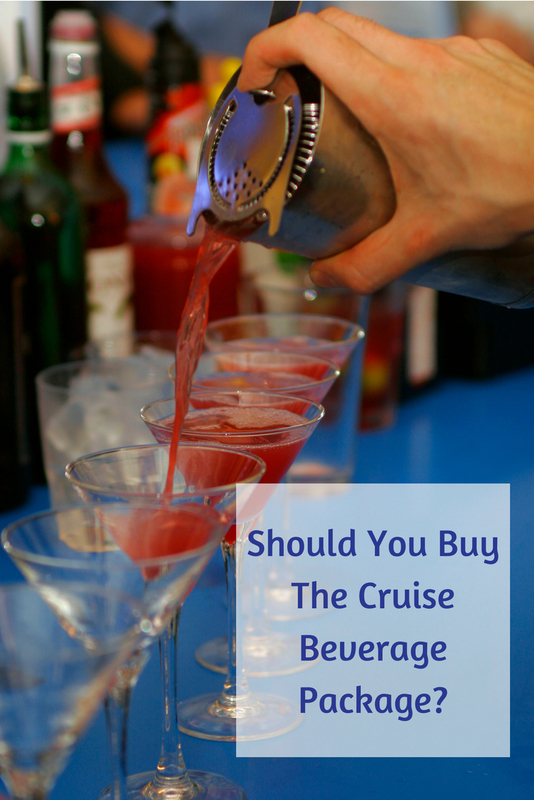 So should you purchase a Cruise Beverage Package? When you first start researching your Cruise Beverage Package and see the PRICE PER DAY PER PERSON you may say NO WAY! I’ll just pay as I go. There is NO WAY I will drink that much. And that may be true. You don’t want a steep and unknown beverage charge at the end of your cruise. If you are on a budget, purchasing a drink package “up front” will save you an unexpected bill at the end of your cruise. You drink bottled water. Or you may want to take bottled water with you when you leave the ship for a shore excursion. Think you’ll save money & just pick up a bottled water at the 7-11 as you walk off the ship? There is not a 7-11 when you get off the ship. And for some shore excursions, you may want to have a bottle of water with you. You enjoy coffee shop style beverages. If you like these specialty coffee drinks in the morning, as an afternoon pick-me-up or after dinner, you can really run up a bill. Think the price of a Starbucks each time you get one. And since you will likely pass their Starbucks like coffee bar several times a day, you’ll be drinking more of them than when you are at home. Why? Because you are on vacation! You drink soda or juice. Or you are traveling with kids who will be ordering a soda everywhere they go on the ship. You enjoy a mocktail or a fruity frozen concoction. There’s something about being on a cruise that just makes it impossible to resist these fun drinks. You enjoy beer, wine or a cocktail. Before you decide NOT to purchase the Cruise Beverage Package, add up the cost per drink per person per day and see what your estimated cost will be. Even if your number is under the price but close, get the beverage package. You will be drinking more of whatever it is you drink on a cruise. The average number of beverages is 6-7 per day on sea days. Less on the days you are on shore excursions. Get My Alaskan Cruise Packing List Here! A package that includes all types of beverages that aren’t included with your cruise price. And then some really break it down to the brand of liquor you prefer. Are you someone that absolutely has to have a certain brand of liquor in your drink? Then look for the package (if offered) where that brand is included. Purchasing a wine or beer package? Is that by the glass or by the bottle? Is that the house chardonnay? What type of beer is included – domestic or imported? Are you a Pepsi drinker but only Coca-Cola products are served on the ship? If they don’t have the soda you drink, no point in buying a soda package. For cocktails, drinks up to a certain price point are the only ones included. For example, your package includes drinks that cost up to $10. But you want to order a drink that costs $11. You will not be allowed to pay the $1 difference. The entire $11 will be billed to your cabin if you order your drink. Have a different drinking style than your cabin mate? Some cruise lines require cabin mates to purchase the same beverage package. If you and your cabin mate have different drinking preferences, this may not work. Ask your cruise line to answer specific questions about the price per drink and what brands are included in each package. It may not be on their website but you can call and ask. 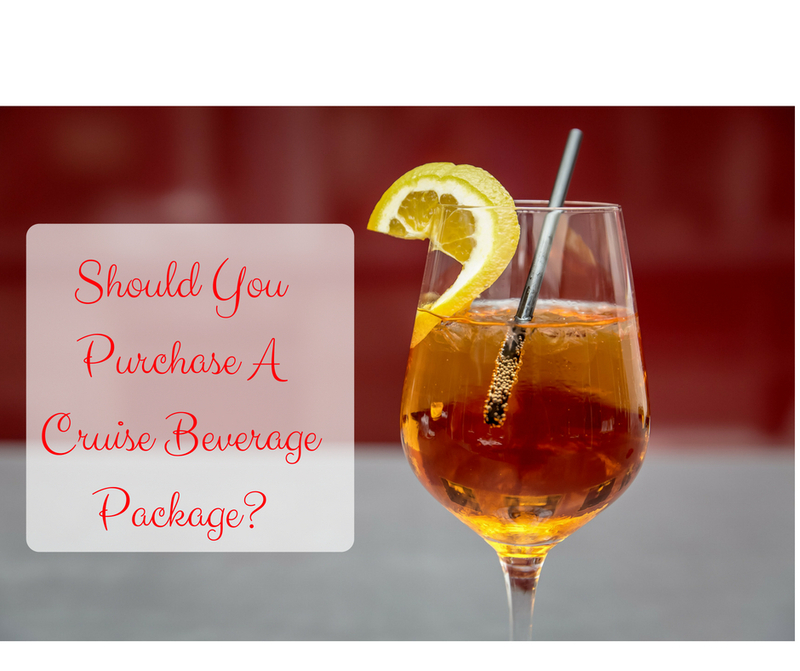 Want to know all the details including what’s in the “fine print” for each cruise line’s beverage packages? See Cruise Critic’s post: Bottoms Up! A Guide to Cruise Lines All-You-Can-Drink Packages. Cruise Critic also has a great forum for asking questions answered by experienced cruisers. Wondering what to pack for your Alaskan Cruise? Get my packing list here! Thanks for this blog. We usually charter a sailboat for just the two of us and never have to worry about this. But I will be speaking on a cruise and this has been something we were wondering about. We have never gotten the drink package on any of our cruises but we always have a big bill when we get off. lol We do drink more than usual when we cruise. And of course, there is always those drinks of the day that by day three all taste the same.